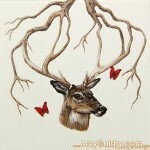 I’ve added two new small works to the In Our Veins series. Both are acrylic on canvas, 4″ by 4,” and $100 each. I just had better photos taken of them, hence the late post. The first painting is titled “Interdependent” and the next one is “Untitled (Desert).” I use tiny paintbrushes on all my work, but they are especially useful for these small paintings as they consist mostly of tiny little dabs and lines of paint. The photos here are rather small, so you can view them full-size on my website at www.amyguidry.com/interdependent.html and www.amyguidry.com/untitled04.html. I’m excited to announce that my work was recently selected for the Surreal Salon at the Baton Rouge Gallery- Center for Contemporary Art in Baton Rouge, Louisiana. 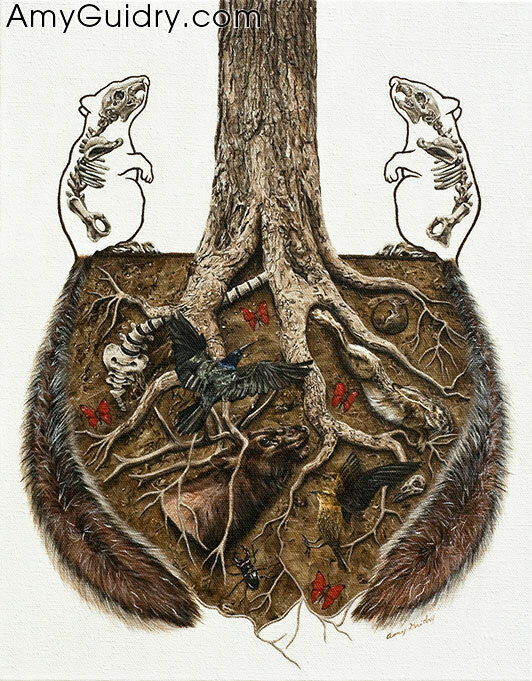 The guest juror is artist Casey Weldon (who will also be giving an Artist Talk at the gallery). I am honored to have my work selected for what will be a great exhibition. 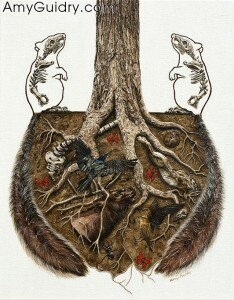 Both Symbiotic and The Pack will be featured, both of which are from my In Our Veins series. I can’t post it just yet, but I did get a preview of the soon to be online catalog, and there is a lot of great work included. The show opens January 3rd (next Tuesday!) and will be up through January 26th. There will be a costumed soiree on January 21st from 7-11pm, with live music from Mobley (Austin, TX) and Prom Date (Baton Rouge, LA). And in case you were wondering, I already have my costume but won’t reveal until after the event- all the more reason to come check out the show in person on the 21st! I wasn’t sure what to title this post other than “Chicago.” I figured Chicago conjures up good things- the band, the musical, the city… so in this case Chicago conjures up another good thing- an exhibition! I was waiting for the results of the 15th International Open at Woman Made Gallery in Chicago and received my notice the other day that my work was selected! I’m excited to be included in this show as well as excited to be showing in Chicago for the first time. I was honored to be one of the few chosen since only 33 works were chosen from 750 entered. The juror for the exhibition is Linda Warren, director of Linda Warren Gallery in Chicago. The show will open March 2nd, with a reception from 6-9pm and will be up through April 26th. Since we are in the midst of the holiday season and there never seems to be enough time in the day, I was inspired to write about a popular question… How much of your time should you spend in the studio and how much should you spend marketing? I’ve heard everything from spend most of your time creating to spend 80% of your time marketing. I can’t say that any one answer is the correct one, however I personally lean towards the marketing end these days. Unless you are a true beginner with a handful of work to your name, you should be marketing your work. Sure, if you don’t have work to show, you can’t have an exhibit. However, you won’t get any exhibits if you’re not marketing your work. And it’s not just shows you will earn, but publicity on the internet, magazines, tv, radio, etc. So back to the big question- just how much and how do you balance it all? -It’s best to do a little each day (as far as marketing goes) but if you are the type that won’t be consistent, it would be better to do your marketing all in one day (or 2…) than not at all. –Gauge your deadlines. If you have a show scheduled, clearly you will need to devote a lot of studio time. Figure out roughly how long it will take you to do the desired amount of work and plan your schedule accordingly. Any remaining time should be spent marketing, especially when you have a show to promote to collectors, the media, etc. –Set limits. It’s easy to lose track of time if you’re buried in paperwork, doing research, or networking via social media. Set a reasonable time limit for each task and stick to it. -Prioritize your marketing goals. There are a ton of things you can be doing to promote your work, so much so it’s overwhelming. But you won’t be doing all of these things everyday, nor do you really need to. Decide what is most important and allot a day or days to accomplish those goals. For instance, how many times a week do you want to post on your blog? Pick the days of the week you wish to do so and keep the remaining time free for other marketing efforts throughout the week. -Marketing is especially important when you have something to crow about. If you go pretty light on marketing, then you should at least devote more time to it when you have a big announcement. If you have a show coming up, won an award or grant, did a big interview, were on tv, spent time in Paris painting for the summer, etc., etc. then you need to up your marketing efforts to announce these accomplishments to your local media as well as your mailing list, email list, etc. These are the things that people want to read about. -It takes a village (well, sort of…). We rely on galleries, collectors, reporters, etc. to talk about us and get our work “out there.” It’s great having this team of supporters, however, some artists think that this is all they need to market their work. Not so. You have to be a team player. Your mailing list is different from everyone else’s on your team, not to mention, you frequent different places- stores, doctors, salons, gyms, etc. And even if someone is already familiar with your work, reminding them that you’re out there only helps to reinforce your brand. –Write it down. This is actually the most important tip I can give so I don’t know why I didn’t think of it first. As mentioned before, it can be overwhelming trying to accomplish everything. Make a list of all your goals- sketching, painting, blogging, gallery proposals, etc., etc., etc. Break it down into a smaller list so that you know what you need to do from week to week, or day to day even, depending on your list. Then just cross them off as you get them done. Personally I like to do all the little things first just because it makes me less stressed when my list is suddenly a lot shorter. Another New Realm painting has found a new home. 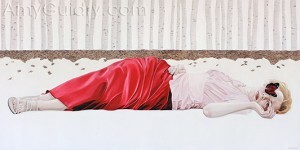 Awakening is one of the earlier paintings from the series and is one of the largest at 48″ wide by 24″ high. 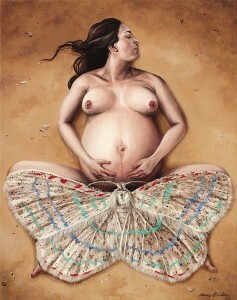 The single butterfly represents growth and freedom, themes that are heavily present in this series. As stated on my website, New Realm challenges the antiquated views of women as often seen in fairy tales. Using a surreal backdrop, it is a modern tale which presents the heroine as a strong and courageous woman. I’m also happy to say that several paintings from this series will be included in a upcoming exhibition featuring works from early in my career to the present. More details on that closer to time. Meanwhile, you can check out this series as well as a closeup of Awakening at www.amyguidry.com/awakening.html. 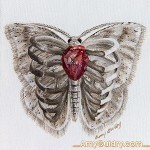 I recently added two new small paintings to the In Our Veins series. 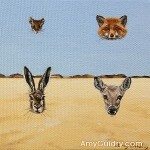 My latest newsletter featured both paintings (which if you would like to receive, sign up information is here: www.amyguidry.com/contact.html) and there is still one available. The titles are Generate and Ephemeral, each are 4″ x 4,” acrylic on canvas. 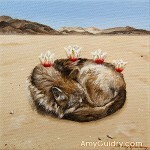 Generate (sold) pertains to the life cycle and how life continues, hence the flowers growing out of the wolf’s back. Ephemeral is still available ($100- contact me if interested) and features a moth with a heart, ribcage, and vertebrae superimposed upon it. The premise of the painting is the importance of life- so fragile, precious, and short, in the scheme of things- and serves as a reminder to live life to the fullest. Both paintings can be viewed (larger) on my website at www.amyguidry.com/ephemeral.html. In addition to my newsletter, to receive my latest updates, be sure to “like” my Facebook Fan Page.